Do You Know The Difference Between Prefab And Manufactured Homes? When talking about different kinds of homes, there may be some confusion in regards to the terms used to discuss what kind of house is being built. Prefab, Modular, Panel Built, and Manufactured are sometimes mistakenly used interchangeably, but they all mean different things. Short for Prefabricated housing, “Prefab” is a broad term that encompasses several different types of building. Technically, any home that has sections of the structure built in a factory and then assembled on site can fall under the “prefab” designation. Both Modular and Panel Built fall under the umbrella term of prefab, but just as different types of dogs are all canines but differ from each other, Modular and Panel Built both qualify as prefab, but are still different. This type of construction can be useful in building houses that don’t work neatly as modules and it can be just as structurally sound as other types of prefabricated building. Commercial prefabricated building is often done this way as it allows for wide open spaces and high ceilings. It is also much less expensive to transport a building in panels than in modules if it is large enough. In the video you will notice that both the first and second story floors are bare when they are lifted in. This is not always the case. Sometimes manufacturers will already have placed anything that can be bolted down. Toilets, sinks, dishwashers, and anything else that can be properly secured during travel can be pre-attached to the floor and cabinets and light fixtures can be pre-attached to walls. This means less work for the builder and saved time and money for you. 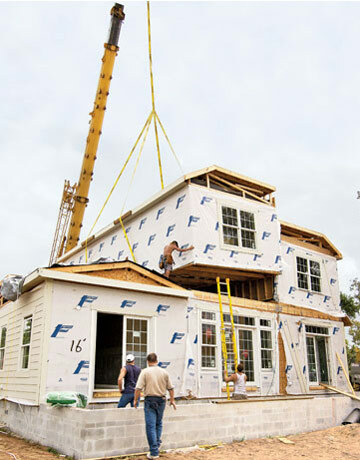 This picture shows a module being lowered in place by a crane. With modular building, the house is constructed in separate box-like modules which are then secured together to form a whole. Since the modules have to be transported on the backs of flat-bed trucks over highways, they generally have to be no longer than the truck and no wider than 16’. This traditionally meant that every room in the house had to be less than 16’ wide, but with new technology, old barriers in modular building are breaking down and houses are becoming infinitely customizable. Modular building usually doesn’t allow for additional structures like garages or porches to be built in the factory, but by combining panel building and modern modular building techniques, modular home factories are able deliver your home up to 90% complete. While built in a factory like prefabs, there is no construction that happens on site. Manufactured homes are constructed on a steel frame, shipped on its own wheels, and then laid on a crawl space, or a slab of concrete. In some cases, the wheels that got the house to the build site aren’t even removed, just covered up with side skirting. The picture on the right has had skirting added to try to conceal that it is a manufactured home. Prefabricated houses of all kinds must adhere to state and federal building codes and undergo regular inspections, just like any site-built home. This ensures that prefab homes are at least as safe as their site-built counterparts, though there is evidence that a well-built modular home is even more sturdy than a similar site-built home. Manufactured homes on the other hand only have to adhere to HUD standards (Department of Housing and Urban Development) which has much more lenient rules and regulations. While prefabricated housing used to be limited to very basic designs, modern building techniques have allowed prefabs to become just easily customizable as site-built homes. 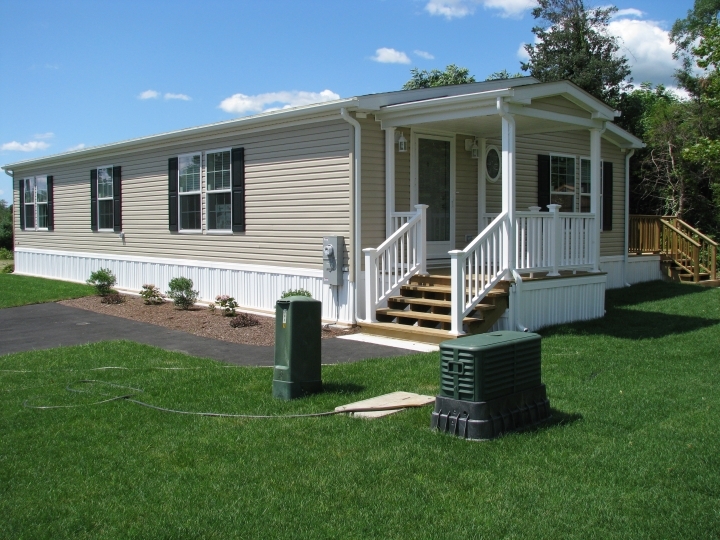 Unfortunately, manufactured homes are still very much constrained, and have extremely limited options. Most manufactured homes dealers will have the home pre-built and then just sell from their available stock. This means that any customizations made would be done by the owner.